Sarah Auma Ochieng is the 2nd wife of Daniel Ochieng. They have 3 children together and also care for 1 total orphan. Sarah would like to start a retail clothing store in the shopping center of the village. She would sell women’s and children’s causal and formal wear as well as some accessories. One of her greatest benefits is there is currently no other clothing store in the village. Sarah has two years of experience working in clothing retail. Sarah is requesting a loan of $740 U.S.
After a 2 month grace period Sarah intends to make monthly installments of $37 to the groups bank account. 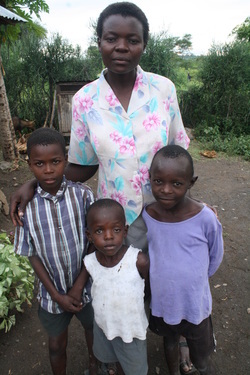 Once her loan is paid back in full it will be paid forward to another family in need. We'll keep you updated on her progress over the next two years and let you know when the loan is paid forward to the next family. Share Sarah's Business Plan with your network and bring lasting change to Sarah and her family.